There are times when I do not touch a computer, it happens. I like to tabletop roleplay for example and I ‘own’ a dog called Fenna who loves to be active. At these sort of times one might be tempted to say that I temporarily get a life. My wife suggested today to visit a little beachside at the IJsselmeer, which is a lake in the Netherlands, to allow Fenna to swim for a while. I thought this to be a good idea, given the heat and all, and off we went. We took two tennis balls with us to throw in the water (for some reason this is the only time balls are of any interest to Fenna? 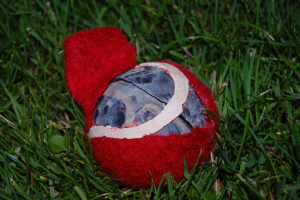 ), which resulted in the utter abuse and molestation of one of those poor little balls. As is demonstrated by this picture. We took this picture after Fenna had a very good time with the ball and she is currently still far too bouncy and happy happy joy joy.